Cooped up cloggers in Ohio are ready to dance! Approximately 162 of us came out for the Cabin Fever workshop at Baku Grotto Hall in Mansfield. There was even a clogger from Canada in attendance! My teammate Laura travelled with her own camerawoman! Brittany was great company all day and took videos of dances for future reference. Thanks, Brittany! Admittedly, I deserved Randi's heckling during "Boogie Fever," Jeff's first teach of the morning. This clogger runs on caffeine, and my delicious salted caramel mocha wasn't quite finished when he started. As you can see, the coffee in no way impaired my ability to perform arm movements! (The trick is in the hand switch.) Obligatory disclaimer: it was an easy routine, my cup was almost empty, and no fellow cloggers were splashed with coffee during my wake-up dance. TREND ALERT: Pulls/slurs/Dorothy slides - whatever you call 'em, almost every routine taught at Cabin Fever contained some variation of this step! My personal favorite teaches from this workshop include "Happy Dance" as choreographed by Naomi and her niece Carnel, "Mean Enough World" by Jeff Driggs, and "Trouble Maker" by Jason Pflugh. None of these are partner dances, btw. Naomi and Jeff were clowning around before starting the next class in the photo above. Feelin' lucky? Wildfire Cloggers from Columbus, OH will be joining up with Dance Explosion Cloggers of New Lexington, OH to perform at Disney in June! They are selling raffle tickets for this Easter wreath covered with scratch-off lottery tickets plus ten bucks in cash. Drawing is Sunday, March 25th. Contact Shirley Lipps to purchase tickets. If you aren't entered, please keep your fingers crossed for me! After my difficulties finding dinner the night before the workshop, lunch was a welcome relief. Food options included pulled pork bbq made and served by Jeff Driggs himself! I made a new friend during awards. She offered to make me breakfast, but told me she was out of toast when I tried to order it. She served pretend pancakes instead. They were delicious. That's her pink toy cell phone in the corner, so this picture is a selfie of a selfie! Award winners included Electric Impulse Studio from Trafalgar, Indiana for bringing the most dancers and for bringing the youngest registered dancer. The clogger from Canada received a prize for traveling the farthest to attend the workshop. The oldest dancer in attendance accepted an award and lots of applause. Workshop attendees enjoyed exhibitions and a much-needed rest before the fun dance. Katie O'Brien and Grace Spreitzer from the 8th Count Dance Center in Garrettsville, OH performed first. They provided a sneak peek of the routine Katie will be teaching at a workshop this April. Josie (center) from Mountain Rhythm Cloggers gave a special performance with teammates Abbey and Cadence. Josie recently won the school social studies fair with her "Appalachian Clogging" project. This qualified her project for the county fair, which fell on the same day as Cabin Fever. Faced with a tough choice, she opted to attend the workshop. This dance was choreographed entirely by 10-year-old Josie. Congrats on your accomplishments in both dance and academics! After Josie's small group danced, the rest of Mountain Rhythm Cloggers (based in Parkersburg, WV) took the floor for a routine with pretty formation changes. N'Step Cloggers from Chillicothe, Ohio (not far from my neck of the woods) showed us a sassy clogging routine. Exhibitions ended with a clogging solo performance by Aaron from N'Step Cloggers. His love of dance is obvious, and he is a joy to watch. 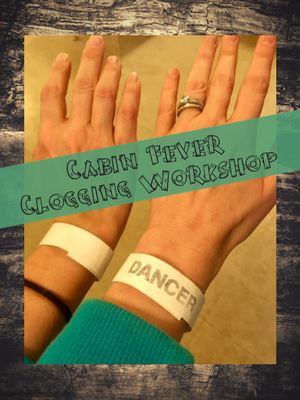 The workshop fun dance included the funniest twist on "Cotton-Eyed Joe" I've ever seen! Is the world ready for stroller clogging? The Der Dutchman's buffet in Bellville is a MUST after dancing the day away at Cabin Fever. Many homemade noodles were consumed. Thanks for a great day of dancing! I appreciate the work put in by Buckeye Country Cloggers and the instructors: Brian, Jeff, Jared, Jason, Naomi. At the rate this event is growing, where are you going to put us all next year?! Thanks also to my teammate Randi for taking some of the photos used in this post. Have YOU ever tried stroller clogging, ha-ha? 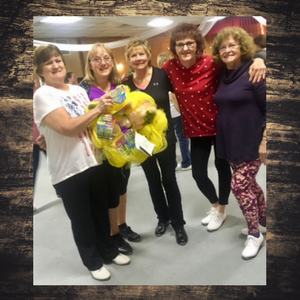 Newer PostDia de los workshop clogging at Florida Clogging Festival 2018!